We return with Colbey and Co. at the City. Some hints about what's going to happen on the page, but we'll get to it soon enough! Some cool SpiderForest announcements to go with the new year: LeyLines returns! 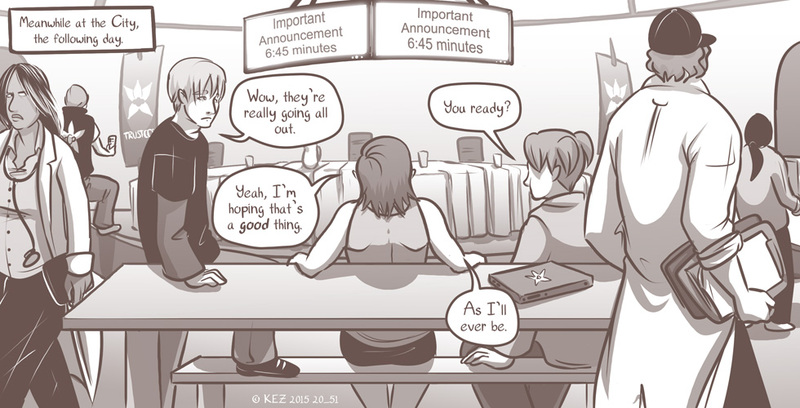 I really love this comic, and am so happy that it's returned to updating! And Malaak, a comic about a wushu-savvy Lebanese superheroine, is now complete! It's 6 wonderful volumes long, you should go over and read it! As for Kez-related news, I bought a Yataghan with the help of the amazing fiance, fashioned a scabbard for it (only way it was affordable was that it DIDN'T come with one), and I also learned how to make fuzzy hats with ears. It was a very busy vacation! With lots of home-made pizza, junk food, and pancreas-murdering good times. I'll post a picture of the sword and the completed scabbard as soon as I finish the decorations. Traditionally, they can be very fancy. So I'll be trying my hand at metal working/texturing/shaping as well! Hope you all had a lovely end of year/beginning of the next. I know things have been really rough in some parts of the US, and some parts of the world. While it may be unrealistic to hope all your families are whole and healthy, that you have enough food and water and a sturdy shelter, it's still my wish for all of you. May our futures together be bright!